In 2015, Relativity Space was founded to change the approach to rocket launches. Its founders want the preparation of a mission and a launch to take place within days, not years. For this purpose, it will be necessary to design a structure the manufacturing of which will be fast. To achieve this, the company decided to use 3D printing. Until now, it has been used to manufacture engines or single rocket components, but Relativity Space wants to go further. Its goal is to print whole rockets. 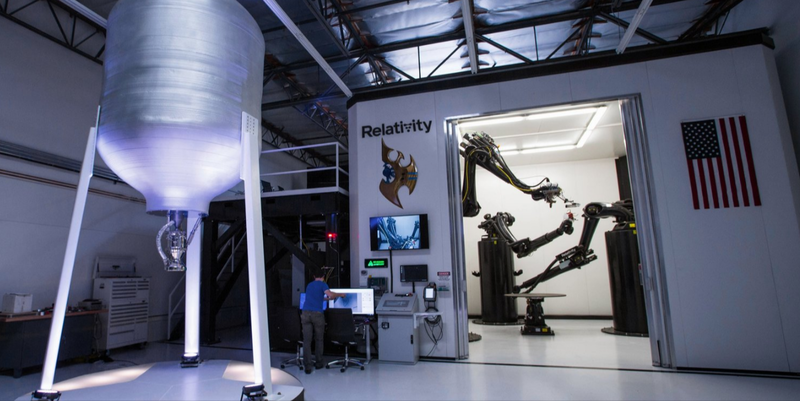 A 3D printer named Stargate is to be used for rocket production, which, according to the company, is the largest 3D printer for printing metal components. In the case of rockets, this is to be a metal alloy restricted by Relativity Space. The advantage of 3D printing over traditional production methods is the speed and ability to create elements with complicated shapes. This, in turn, is intended to help reduce the number of rocket components by 100 times, comparing it to a traditional methods of manufacturing. It will also help to speed up the production 10 times. Using a 3D printer will also make it easier to make corrections and produce new rocket versions much faster. The company wants it to take no more than 60 days from the delivery of raw materials to the launch-ready rocket. The first rocket, which Relativity Space plans to launch as early as 2021, is to be Terran 1. This two-stage design will be powered by engines burning liquid methane and liquid oxygen. The first stage will use 9 Aeon 1 engines, on which the company is currently working, and in the second stage, one vacuum-optimised Aeon 1 engine will be used. This solution - 9 engines in the first and 1 in the second stage - is already well known for SpaceX's Falcon 9 and Rocket Lab's Electron rockets. The rocket is to be able to launch a 700-1250 kg payload into orbit. It is therefore intended to fill the gap between large rockets carrying heavy communication satellites and small rockets capable of launching a satellites with a mass of less than 500 kg. In just 12 months from the start of work on the Aeon 1 engine, the company carried out more than 85 of its tests. Like the rest of the rocket, the engine is also 3D printed. Thus, according to Relativity Space, the engine is composed of less than 100 components. The fuel which will be burnt by the Aeon 1 engine is not a random choice. One of the company's goals, like SpaceX, is to enable people to live on Mars. To make this possible, it is necessary to create rockets that will deliver astronauts on the Red Planet and will also allow them to return. With 3D printing, it will be possible to create rockets on Mars in the future. In turn, methane can also be produced there, which is one of the components of the fuel used in the Relativity Space's engine. With the recent success of the Electron rocket and preparations for the launch of other small launchers such as Vector-H, we can witness the beginning of a completely new era in spaceflight. You can watch the Aeon 1 engine test below.